Taking a play from the National Hockey League who has had their own televised awards show for a few years now, the National Basketball Association, (NBA) decided to do the same. The Players Awards, otherwise known as the NBA Players Association Awards, were taped here in Las Vegas on July 19 at the Rio Hotel & Casino in the Penn & Teller Theater. Look for some highlights from this past NBA season as well as awards for Best Defender, Player You Secretly Wish Were on Your Team, Hardest to Guard, Best Clutch Performer, and more which are given to some of the top NBA players as voted for by other NBA players. With appearances by LeBron James, Ray Allen, DeAndre Jordan, Allen Iverson and many others, you'll see guys in the same room that you never otherwise would unless they're fighting over a ball on the basketball court. The Players Awards are hosted by comedian and SNL cast member Jay Pharoah. An impersonator of Will Smith, Denzel Washington, Barack Obama and others, Jay is a man of many talents with his fast paced and sometimes biting, but good-natured humor. Comedian Hannibal Burres also makes an appearance. The show opens with a musical performance of Glory by Lil' Wayne, and also features Monica, Kid Ink, Fifth Harmony, and 2Chainz and crew, who use some amazing new IOHawks, (personal mobility devices) as part of their choreographed dance number. These may look like electric skateboards but there is much more to them which is why they go for around $1,800 a piece. I stood in for Fox Sports' Kaileigh Brandt, and my friend Kevon, for former NBA player and commentator Jalen Rose. We had the chance to work on our improv and commentating skills during rehearsals....at least until they took over for the show. 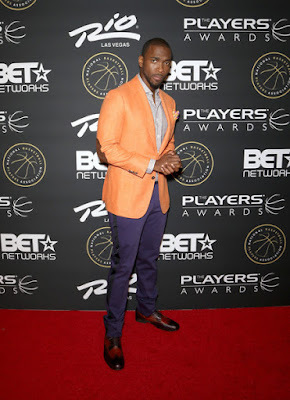 If you're a basketball fan or even a sports fan be sure to check out The Players Awards July 21 on BET! Last week everyone at Hard Rock's Vinyl lounge was taken on a musical journey back to the 80's with some popular performers from the Las Vegas Strip who generously donated their time for this concert special. Second in The Set List series, the album Slippery When Wet was featured and played in sequence from beginning to end with proceeds going to the Rudy Foundation. Slippery When Wet was a huge success when released back in 1986 at the height of what has been referred to as the "big hair band" era of rock and roll. Although written and released some thirty years ago the songs of this album are timeless and identifiable to most. This collection catapulted Bon Jovi into a multi-decade career as one of the top selling bands of all time. The Set List, Paul Johnson, Lily Arce and Brandon Nix with musicians performing songs from "Slippery When Wet"
Presented by House Seats, The Set List was headed up by the trio of Brandon Nix, Paul Johnson and Lily Arce. Paul and Brandon are currently starring in Rock of Ages and Lily is an occasional performer with Cirque Du Soleil. The three kicked it off with the performance of the first song from the Slippery When Wet album which was Let It Rock, followed by a fervent rendition of the #1 hit You Give Love a Bad Name, by Brandon Nix. Paul Johnson gave his solo interpretation of Livin' On A Prayer, (another #1 single from the album), then all three segued into Social Disease, a song which one could say has an even broader meaning these days due to social media, non existent back when this single was written. Lily Arce introduced her acoustic version of Wanted with a personal story about her father sending her this song from where he was stationed in the military during the time of its release. Raise Your Hands was another group collaboration with special guest Anne Martinez who performed in the last Set List concert and is a resident artist at Hard Rock. Without Love was belted out by Lily Arce then followed by a heartfelt edgy duet of I'd Die For You, by Paul Johnson and Lisa Marie Smith. Lisa, whose act I recently caught in the show Pin Up, is one of the leads of that production. Brandon Nix was joined by special guest Becca Kotte, (Rock of Ages) for Never Say Goodbye. Brandon is a passionate entertainer and a true stand out in every production I've seen him in....The album was brought home with a finale of all performers on stage for Wild in the Streets. A special encore of bonus songs from Slippery When Wet and other Bon Jovi hits was performed to close out the night with a surprise appearance and performance of Runaway from Mark Shunock (Rock of Ages), then Lay Your Hands On Me by Lily Arce, I'll Be There For You with Brandon Nix, then the mega hit It's My Life and lastly, Bad Medicine from the three headliners, Paul, Brandon and Lily. Proceeds from the show went to The Rudy Foundation, whose mission led by Executive Director Cheryl Ruettiger is to make a positive impact in the lives of children and adults by sponsoring programs in the community for education, sports and the performing arts. Next up for The Set List is Michael Jackson's Thriller on Oct. 8 followed by Frank Sinatra's The Main Event on Dec. 10 to wrap up the series for the year. Tickets can be purchased through houseseats.com.